SCVHistory.com | Los Angeles County Election Results, 1849-1879: L.A. County Rejects Lincoln (Twice) & Chinese Immigration. 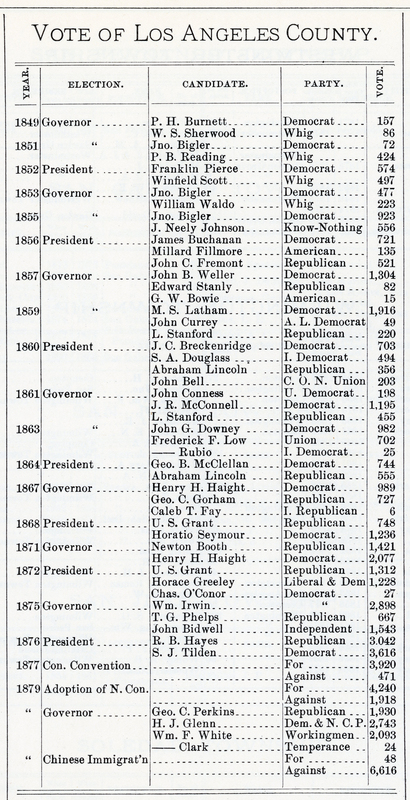 Los Angeles County never voted for Abraham Lincoln. When he first ran for president in 1860 he didn't even finish second in L.A. County; he finished third behind Kentucky Democrat John C. Breckenridge (who would be expelled from the U.S. Senate in 1861 when he joined the Confederate Army) and Stephen A. Douglas, famous for the Lincoln-Douglas debates of 1858 and the architect of the Kansas–Nebraska Act, which opened previously prohibited territories to slavery. A decade later, the transcontinental railroad and its southern extension to Los Angeles (through the Santa Clarita Valley) having been completed, the (all male) American electorate and their political leaders wanted to evict the Chinese laborers who had built the new roads. Congress passed the Chinese Exclusion Act in 1882, but not before California adopted a new Constition which completely overhauled the legal system and barred the hiring, "directly or indirectly, in any capacity, any Chinese or Mongolian." It further mandated that the Legislature draft laws "to prohibit the introduction into this State of Chinese after the adoption of this Constitution." Los Angeles voters ratified the new Constitution by a margin of 4,240 to 1,918. The Federal Circuit Court overturned the anti-Chinese provisions of the California Constitution in 1880, but the federal legislation two years later, signed into law by President Chester A. Arthur, would have similar effect. In the run-up to the 1882 Exclusion Act, Eastern members of Congress questioned whether the objection to Chinese immigration out West was truly the will of the public or just that of labor unions that didn't want to compete with Chinese immigrants for jobs. Writing in 1909 about his own newspaper's crusade against Japanese immigration at the beginning of the 20th Century, San Francisco Chronicle Editor John P. Young notes that in the 1860s and 1870s, "(the belief) that there was no unanimity of sentiment in favor of putting up the bars (against Chinese immigration) was fostered by the publication of articles in the Eastern press asserting that the development of California was absolutely dependent on Chinese labor, and that without an abundant supply of it, there would be an end to the progress of the state." So Congress empaneled a committee in 1868 to investigate. It came to California and conducted interviews, but even at that time the wheels of government turned slowly. Not until 1879 did Congress draft and approve its first attempt at an Exclusion Act (President Rutherford B. Hayes vetoed it). To demostrate its resolve, the California Legislature asked the voters a question. It placed an item on the ballot that said simply: "Chinese Immigration" — For or Against? Los Angeles County voted "Against" Chinese immigration by a resounding 6,616 to 48. The results were matched statewide by a vote of 161,405 to 638. The Chinese Exclusion Act stayed on the books until 1943. 9600 dpi jpeg from Thompson & West (1880).